Boy, it was a Monday wasn't it? Nothing tragic here thank goodness. Just a series of events that when strung together make for one messy and tiring day. [draining work situations, power outages, cat pee on the floor, a poo on another kitty bottom (that I had to um, take care of), etc.] By the time my water bottle broke all I could do was laugh. I mean really. And also think about how I could have handled these things better; with more grace, more prayer, more deep breaths, and even more laughing. 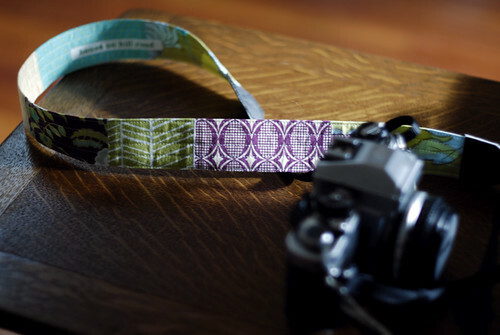 But then getting Erin's beautiful camera strap in the mail, chatting with a friend this afternoon and then going on a nice long walk with another friend helped turned the day around. You know I never feel worse after a walk or talking with a friend, it always helps. Every day is a lesson isn't it? In being a better person. And thankfully tomorrow is another day. There's a little interview I did at the new issue of Cupcake Magazine, (my piece starts at page 142.) Thanks Amy!